SSC CHSL 2017-18 Tier-1 exam is scheduled from 4th to 26th March, 2018. With less than two months to prepare for this highly competitive exam, it is important to have the correct preparation strategy and reliable exam resources. To assist aspiring candidates, Oliveboard is conducting a FREE SSC CHSL 2018 All India Live Test from 19th to 22nd Jan 2018. This test is free of cost. Candidates will receive their score instantly. All India Results & Detailed solutions will be available on 23rd Jan 2018 on the portal. This live test will help the candidates evaluate their preparation on an All-India level, against other candidates. 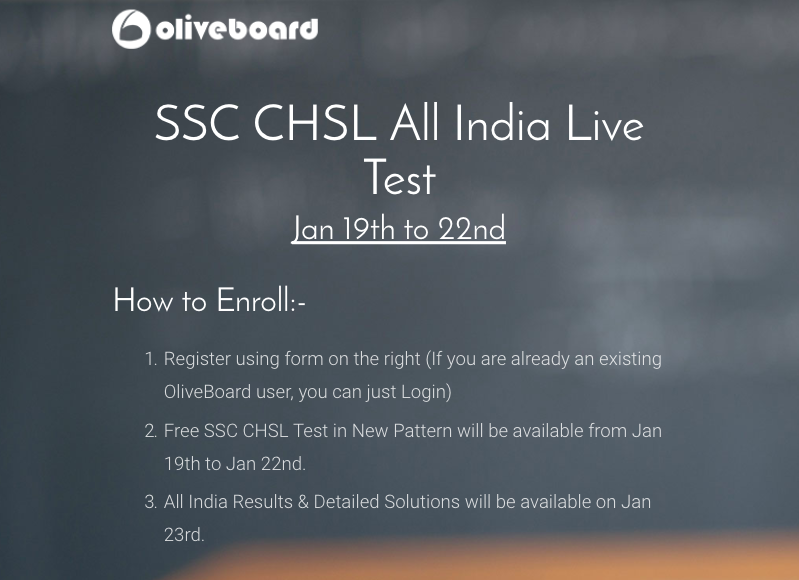 Take the SSC CHSL-2018 All India Live Test to evaluate your preparation and check your All India ranking. Disclaimer: This is an Sponsored Post and the contents may not be treated as personal views of Team Qmaths.